A new report published by the American Association for the Advancement of Science found that four major archaeological sites in Syria have been heavily looted and damaged. “Ancient History, Modern Destruction: Assessing the Status of Syria’s Tentative World Heritage Sites Using High-Resolution Satellite Imagery” analyzes six of the 12 sites that Syria has nominated as World Heritage Sites: Dura Europos, Ebla, Hama’s Waterwheels, Mari, Raqqa and Ugarit. The report analyzes high-resolution satellite images that document the destruction in the country. AAAS’s Geospatial Technologies and Human Rights Project authored the report, and the Smithsonian and the University of Pennsylvania Museum’s Penn Cultural Heritage Center contributed to the research discussed within it. The most extensive looting occurred at Dura Europos, which was founded in the third century B.C. Imagery analysis shows that by April 2014, about 76 percent of the area within the city wall had been damaged. At Ebla, the site of an important Bronze Age Kingdom, images show looting pits, eroded walls, heavy-vehicle tracks and newly constructed military compounds. Widespread looting was found in Mari, an ancient trade city founded in the third millennium B.C. 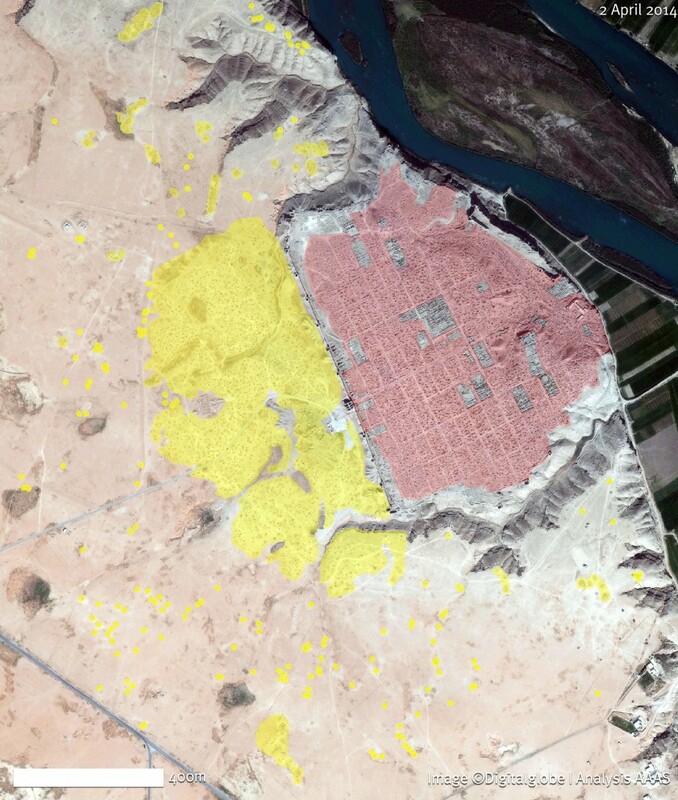 The damage at Raqqa, an important site that exemplifies the transition of a Greek/Byzantine urban center into an Islamic city, was specific and targeted. Images show certain buildings have disappeared from the site while surrounding buildings remained untouched. Two other areas—Hama’s Waterwheels and Ugarit—do not appear to have sustained any damage. The findings in the report will help inform future preservation efforts. A forthcoming report will analyze the six additional sites nominated by Syria as possible World Heritage Sites.